Deciphering high resolution records of marine environmental change during past warm extremes of climate to assist development of observational and numerical models. These models are designed to aid prediction of potential environmental responses under the present phase of global warming. 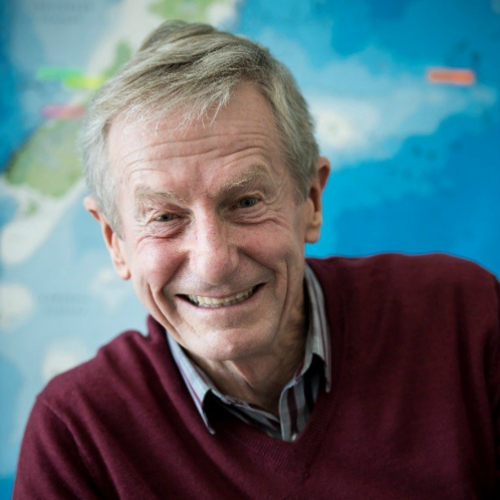 While the research involves large scale perspective of the climate ocean system, it focuses on the New Zealand region, which because of its oceanic isolation, has its own particular its own response to warming. Application of the results of the recently completed first phase of the Antarctic Drilling (ANDRILL) programme to identify the affect of a changing Ross Ice Shelf on the ocean circulation and water masses in the New Zealand region. Determining the processes that govern the transport of sediment from the mountains to the ocean off the central eastern North Island (in collaboration with the US MARGINS programme). This region is a prime site because of its large environmental signals, e.g., rivers have the highest sediment input in N.Z., strong El Niño-Southern Oscillation signal, and its location at the meeting place of subtropical and subantarctic waters. The research, which is in collaboration with US partners and NIWA, also takes the opportunity to relate ocean change with that occurring onshore. Determination of the abyssal circulation and its interaction with the ocean floor in the SW Pacific Gateway off eastern N.Z. This system of currents forms the local component of the Ocean Conveyor, which is one of the major transporters of heat around the planet as well as a regulator of climate change. Discovery of the long distance transport (> 2000 km) of sediment and its accumulation as extensive sediment drifts under abyssal currents. Identification of the Eastern New Zealand Oceanic Sedimentary System (ENZOSS), whereby sediment generated at the southern sector of NZ plate boundary is transferred to the deep ocean, transported up to 4500 km by abyssal currents and returned to the northern sector of the plate boundary via the Kermadec subduction zone. Determination of the structure and evolution of the complete1000-km-long Bounty Channel (an ENZOSS component) including discovery of the extensive Bounty Fan (with R.M. Carter). Discovery of >400 km-long Solander Channel, another major component of ENZOSS. Successfully proposed the drilling of sediment targets off eastern NZ (with co-proposer R.M. Carter). The 5- year-long proposal process bore fruit with completion of Ocean Drilling Program Leg 181 in August - October, 1998. First NZ application of acoustical techniques (echo-sounding and high-resolution seismic records) to rapidly map substrate types on the ocean floor. Formulation and publication of a new generation of award-winning charts of the waters and ocean floor in the NZ region (co-leadership with I.C. Wright and R. Garlick). First development of benthic monitors in NZ to determine changes of the seafloor under varying hydrodynamic conditions. Introduction of the first large scale, seabed mapping programme to NZ - the GLORIA side-scan sonar survey of Bay of Plenty in 1990 (with K.B. Lewis and I.C. Wright). Successful promotion of NZ as one of 2 sites world-wide to be studied under the auspices of the MARGINS Source to Sink programme (with other NZ colleagues). Application of research skills and instrumentation to a wide range of applied projects for government and private industry. Commissioned as the Marine Environmental Advisor to the International Cable Protection Committee, representing 74 submarine cable companies. View a list of publications from Lionel Carter.